Two whales that washed up in the Bay Area last week died due to human-related causes, Marine Mammal Center officials said Wednesday. A fin whale found near Jack London Square in Oakland on Friday morning died after being struck by a ship, and a gray whale carcass that washed ashore in Marin County later the same day died after being severely entangled. The fin whale was a 45-foot female juvenile that suffered massive hemorrhaging on both sides after the collision, center officials said. It was towed to Angel Island State Park, where scientists performed a necropsy. Center officials confirmed the juvenile was the same whale reported to the National Oceanic and Atmospheric Administration on May 16, after it was found draped across the bow of a large ship entering the Bay. 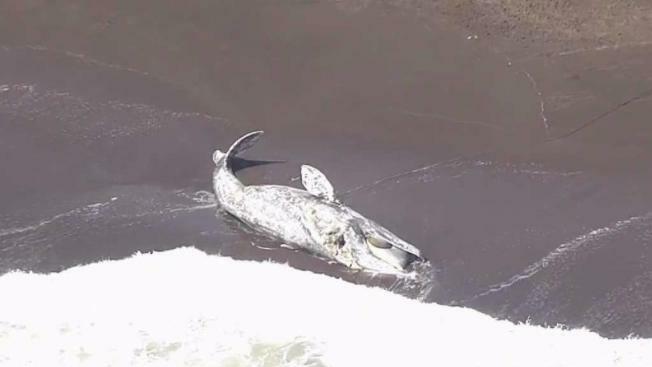 The 36-foot adult female gray whale found at Tennessee Valley Beach in Marin County suffered lesions around the back of her neck and both front flippers. She also had two lacerations on the right side and multiple skull fractures consistent with a ship propeller, according to center officials. The two cases are unrelated, but ship strikes are the leading cause of whale mortality, followed by fishing gear entanglement, center officials said. Whale collisions with large container vessels often go undetected, and ship strike deaths are underreported as a result, according to the center. "The deaths of these two whales highlights the direct negative impact humans can have on marine wildlife," Marine Mammal Center veterinary director Dr. Shawn Johnson said in a statement. Scientists from the Marine Mammal Center and University of California at Davis conducted the necropsies, and Johnson said the procedure is critical to understanding how humans can safely share the ocean with wildlife.